In large saucepan cook carrots, covered, in lightly salted boiling water 5 minutes. Add broccoli; cook 3 to 4 minutes more or just until vegetables are tender. Drain. Meanwhile, heat oil in large skillet; add shrimp and tomatoes. Cook and stir 3 to 4 minutes or until shrimp are opaque. Transfer to serving platter with vegetables. For sauce, in skillet combine honey, chili sauce, and juice; heat through. 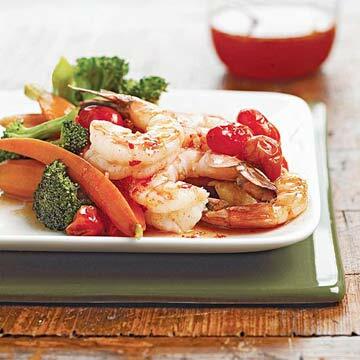 Spoon over shrimp and vegetables. Serves 4.